I remember the 1940s in Regent’s Park Road when all the shops had big blinds fitted. Most were sign-written with the name of the shop, and their purpose was to keep the shop cool in summer. If it was raining they also provided cover along the street. 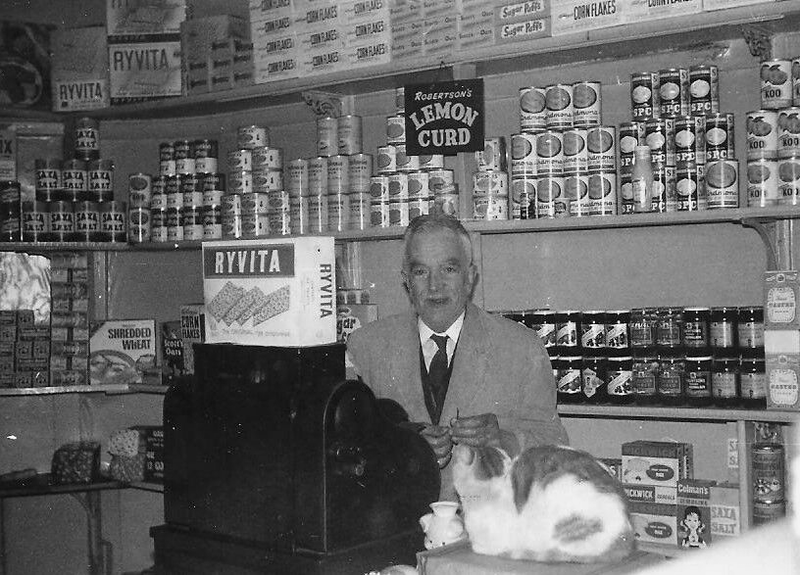 If on a half-day it started to rain and a shopkeeper had forgotten to pull his blind back in, my Grandpa, who ran a grocer’s, might well do the job using the long blind-pole from behind the shop door. He would also keep a look-out for young lads who liked to jump up and swing off the arms of the blind. I recall that as a measure to repair bomb damage the shops were refitted sometime after the end of the war. I was very excited as this meant an end to the wooden shop front. We had a big glass window fitted and Grandpa chose maroon paintwork and a cream fascia with ‘Geo. Corbett – Grocery & Provisions’ written in script on it. Next door, Mr Welsh chose green with red piping and had the inscription ‘Oil, Colour & Domestic Stores’. Beside our till (another thing that would be worth a fortune now) there was a Bakelite socket. It had once powered the till, but Grandpa now hand-cranked it. It was a big maroon job with buttons in rows for the amount to be rung up. It had pounds, shillings and pence, and then three-farthings, a halfpenny and a farthing. I used to see what was the highest amount I could ring up. I think it may have been £99, 19 shillings and 11 pence three-farthings. I’m not sure about the £99 – it may have been £9; after all, you’d need a mighty big bag to cart off £99-worth of food in those days! I doubt whether anyone’s grocery bill could have come to more than £3 then. Anyway, each time I passed the till I’d stick a finger in the Bakelite socket for a shock. It was 220 volts DC, so I don’t suppose I was getting the full whack or else I’d have been flat on my back. But it highlights the dangers that lurked in ordinary households, which we are more alert to today. Certainly there was no earth in the sockets. In our flat at the top of the house there was only one wall socket: a great metal-clad thing with a fat rubber wire feeding it and a Rubik’s Cube of adapters coming out of it to feed the electric fire, the radiogram and the TV. Mum used to iron from an unearthed adapter that fitted into the overhead light! Yes, we did have TV. My dad saw a TV in Mr Wilson’s shop up the road that worked on DC current. In fact, our Pye TV was one of the first to work on both AC and DC. Dad had to put a scratch on the plug to make sure it was plugged in the right way round. If you put it in the wrong way the telly smoked. Once a year Dad put the plug in the wrong way for a short time as we found it seemed to go better after a smoking session! Despite the screen being only 9 inches, the ‘works’ were contained in a box about the size of a modern-day kitchen unit. On both Coronation day and Cup Final day, our little lounge was rammed with uncles and mates of my parents who came in to watch the TV. I felt very important then. What got us converted to AC current was some legislation about keeping cold food in the shops. Nowadays they would need a refrigerated display counter. Our old butter cooler was redundant. I never knew how it worked, but water ran down the sides (I think) into a galvanised trough beneath the base. It was glass-sided to show the produce ‒ a really nice piece of equipment. Anyway, it had to go. Big expenditure was called for and a cold cabinet ordered. But first men came and dug up the pavement and switched us onto AC current. When the fridge came it was so big it would not fit through the door. Grandpa had to take off the door and cut a bit from the door frame to get it in. After a while Grandpa got tired of having to bend down to slide the fridge doors open and shut. They were too low to be practical. So the butter, bacon, margarine and fats stayed in the old cooler which had done the job for years, and our old cold counter displayed a great selection of tinned goods! I don’t think anyone got ill from this method of storing their eggs and cheese, but of course we were a lot tougher and resilient in those days ‒ you had to be. Quite a few of the houses in the area had no electricity at all. For listening to the radio these homes had an accumulator. This was a small lead-acid battery that you took to Mr Wilson’s shop a couple of doors down for him to re-charge. He had a high shelf where rows of customers’ accumulators sat charging. Below that was a row of wooden drawers where all manner of mysterious radio tools and spares were stored. He also owned the shop next door where he sold cycles. If you wanted anything from next door he had to come out and unlock the shop. In truth, that soon after the war, I don’t think there were any new bikes to be had, so the stock was probably second-hand. But there was an intriguing window display of tools, pumps, chains and brake bits that held my attention for many minutes as I wandered off towards school each day. 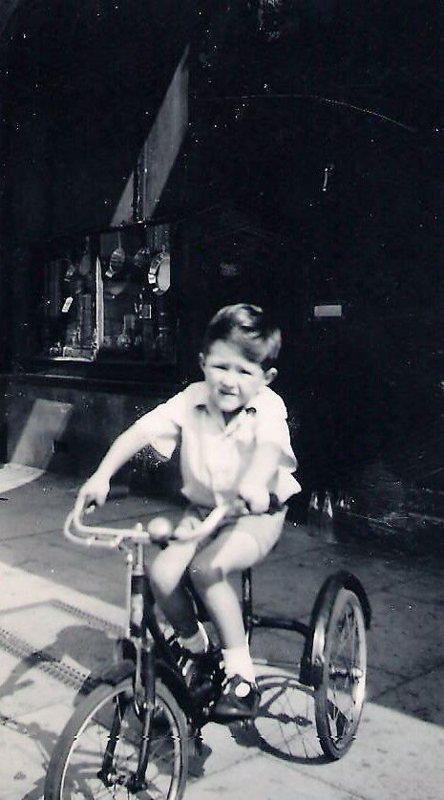 I recall the lengths my mum went to get me a bike. You had to put your name down with another mother who had a child reaching the stage when they needed a bigger bike. There was one little fairy cycle that practically every child in Primrose Hill had learned to ride on!